Flexispeed were based, originally, at 5 South Lane near the centre of Sheffield, England and by August 1946 were advertising their first product, a miniature and very basic 15/8" centre height, plain-turning model-engineering lathe at £6 : 16s : 6d. This was to prove a very popular machine that, continuously developed with numerous alterations and improvements to the design, was to continued in production for nearly fifty years - though ownership of the Company was to change several times during those decades. Flexispeed also manufactured, from around 1951, a small horizontal milling machine and a 5-inch hand-operated shaper. While examples of the miller are not uncommon, the shaper is extremely rare and few can have been sold. 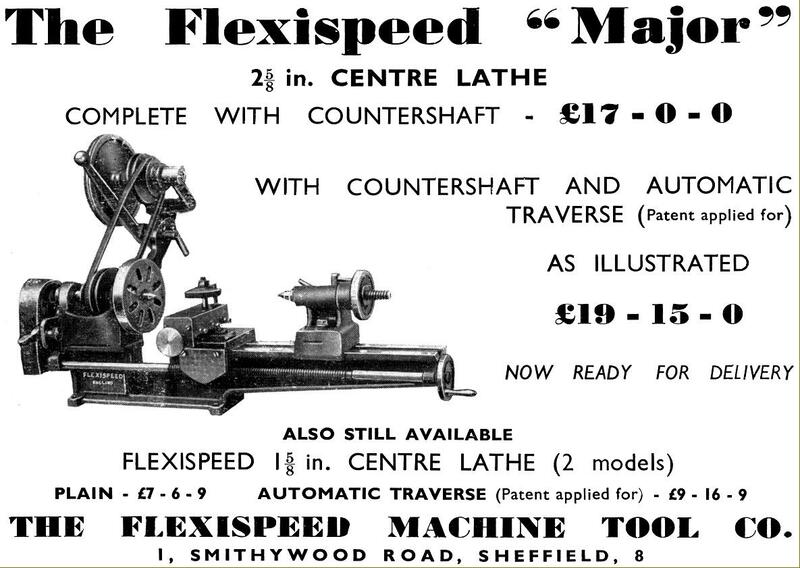 By 1948, and owned by a Mr. L. Lewis, Flexispeed was selling their lathe from 1, Smithy Wood Road, Sheffield 8, and describing themselves as "Manufacturers of: lathes, chucks & accessories, bench milling machines (and) hand shapers" - the site of what must have been the small works still visible in 2015. After 1960 ownership of the design appears to have passed through several hands including Brian Perris (who made some significant alterations) and then, on his death in 1976, to Sid Cowell where it appeared in 1977, almost unaltered, as the first of his new range of miniature machine tools. In-between times the lathe was marketed variously as the Meteor, Hector, Norfolk and Simat. Although very much more heavily constructed and of far better quality, the early Flexispeed was not dissimilar to the "Super Adept" made by a branch of the Portass family, F.W. Portass, whose factory, in Sellers Street just off Abbeydale Road, was only half a mile away from the original Flexispeed works. In 1947 Adept were quoting an astounding twelve months for delivery and there was obviously room for competition - accordingly, the Mk. 1 Flexispeed was introduced. Some 13-inch long, it had a centre height of 15/8", a capacity between centres of 51/4 " and a flat-topped, 13/8" wide V-edged bed with a 43/4-inch gap. The carriage consisting of a simple saddle with a bolt-on apron in bronze - the inside face of which was shaped to form a full nut for the square-thread leadscrew to run through - and wase was guided in the conventional way against the 60-degree sides of the bed (a decided improvement on the wear-prone single slot down the centre used on the Adept). Mounted on the saddle was single, swivelling toolslide with a simple triangular toolpost. Cast as-one with the bed, the headstock held a 1/2" diameter spindle of mild steel. It was bored through 1/4", had a 1/2" B.S.F. (British Standard Fine) nose thread and ran directly in the cast iron of the headstock, the bearing being split and provided with a modicum of adjustment as they were closed down by set screws. Surprisingly, this assembly, if well lubricated lasts a long time, aided of course by the free graphite present in the cast iron. A 2-speed pulley was fitted, intended to be driven by a miniature V-belt or a round leather (or plastic) belt; both the headstock and set-over tailstock were equipped with "short" No. 0 Morse taper centres. Oddly, apart from a delicate and easily destroyed gold-coloured sticker, the lathe carried no maker's identification and today the writer receives a constant stream of requests to identify this particular machine. Delicate maker's badge. Few survive. An unrestored and completely original 2-speed Flexispeed Mk 1 15/8" x 6" built 1946 to 1949. Note the overhung leadscrew, the simplest and cheapest way of providing a carriage traverse for the full length of the bed. 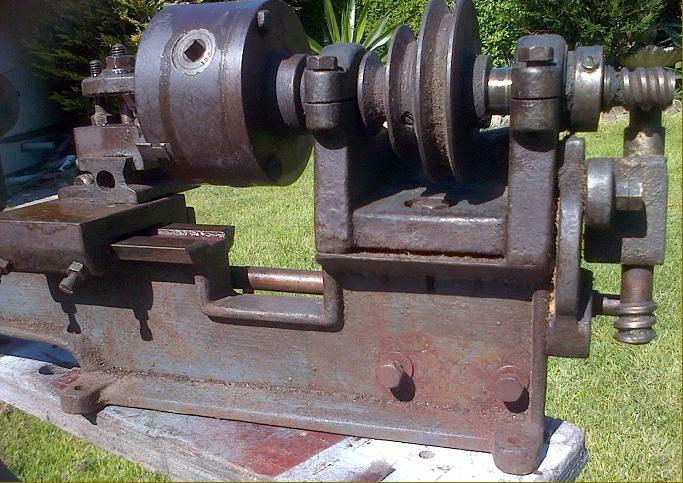 By mid 1948 a modified lathe was introduced, the Mk. 1A (though the Zyto Model F, made by Flexispeed, had been advertised - but not illustrated - with the same specification some months earlier). The new model retained the original "short-foot bed and single swivelling toolslide but had a full-length leadscrew driven from the headstock spindle through a two-stage worm-drive reduction, the latter assembly granted British Patent 642,260. One worm was cut into the end of the headstock spindle, the other on the end of the 7/16" diameter, square-thread 12 t.p.i. leadscrew with the assembly pivoting to provide a means of engagement and disengagement. However, the mechanism (although it produced a remarkably fine feed through simple and inexpensive gearing), only provided a movement towards the headstock, a handwheel being fitted for manual advance and retraction of the carriage. In addition, with its fixed-ratio drive, it could not provide a screwcutting feed, that development having to wait until the introduction of the Perris version (though an example has been found of a particularly well engineered conversion that might have been a factory prototype or special-order - but more likely a home-conversion job). It is likely that Mk. 1A would have been offered in various forms, as the customer's pocket dictated, with one version having a separate, bolt-on headstock able to be fitted (at extra cost) with an all-steel 4 : 1 backgear assembly mounted on an eccentric shaft. In December 1948, with competition from the likes of Grindturn/Haighton and Wizard becoming stronger, a more thoroughly machine was introduced, the "Major", its arrival celebrated by a quarter-page advertisement in Model Engineer Magazine. Newly based at Smithy Wood Road, Flexispeed listed this machine, at an expensive £17 : 0s : 0d. It featured a separate, bolt-on headstock with the centre height increased to 25/8" (thought at first the original headstock spindle was retained), a much longer and very distinctive bed foot with a vertical face at the left-hand end, a choice of 8 or 12 inches between centres and a rather complex built-on 3-speed countershaft. If the buyer could raise £19 : 15s : 0d he was offered the option of the worm-drive power-feed attachment. The Major did not displace the older 15/8" models but ran alongside them, the market demanding both low cost and higher specification models. Today the "Major" is seldom found (the bed-foot end face is the key recognition feature) for, at the high prices charged, few can have been sold. The Smithy Wood Road site appears to have been that of a cottage industry with Number 1 being the first house of a domestic terrace with, beside it, a space now occupied (2012) by a small repair garage - and so likely to have been the factory site. By 1950 the "Major" had been further improved to included a proper compound slide rest - although without micrometer dials (they were never to be fitted) - and, in this form with an additional range of much lower spindle speeds, proved to be a very much more versatile and useable lathe than the early. Flat-topped and with 60° V-edge ways, the bed was of the same cantilever pattern as before (allowing it to be bolted down without distortion) but, at 11/2", was just a little wider. Capacity in the bed gap was 51/4", the ways carefully finished by hand scraping. A compound slide rest was supplied as standard with the cross slide carrying a single (central) T slot and the top slide fitted with a 4-way toolpost. As delivered the lathe was fitted with simple sheet-metal guards over the headstock and leadscrew drive mechanisms, a 4" diameter faceplate and hard and soft No. 0 Morse centres. Eventually, in order to cater for all sections of the market, the Mk. 2 was listed in four versions: the Model "A" had backgear and auto traverse, the "B" auto traverse only, the "C" backgear only and the "D" as a plain lathe with just hand feed to the carriage. Optional extras were to eventually included a tiny bench-mount countershaft with a 5-inch driven pulley, a 4-jaw chuck (with its mounting thread cut into the main body), a plain vertical milling slide, fixed steady, tailstock die holder and a tailstock chuck. In 1951 prices appear to have been adjusted downwards with the Model "A" was listed at £11 : 9s : 6d with the countershaft £1 : 7s : 6d the 4-jaw chuck £1 : 17s : 6d. All these changes left the simple Adept far behind but, surprisingly, and only because of its considerable price advantage, the Adept kept selling. December 1948 advertisement for the new Flexispeed "Major"
A slightly later Mk. 1 Flexispeed with 3-speed drive. Behind is the remarkable American ManSon lathe, also of the 1940s, but even smaller than the Flexispeed - just 9" long and with the appearance of a perfectly crafted miniature of a full-size machine. In 1954 a short-lived version of a new basic Flexispeed, the "Student" was introduced at a very competitive £5 : 17s : 6d. This model, intended to compete against the ever-popular and very cheap "Super Adept" reverted to the original 15/8" centre height but was fitted with a proper compound slide rest and a 3-step headstock pulley. Unrelated to the established types in the range almost every detail of its construction differed. A very smooth bed casting was used, without the usual edge ribbing, secured to the bench just two hold-down bolts at the headstock end. The tailstock, unlike that on all other Flexispeed types, could not be set-over to turn tapers. By 1960 changes were afoot with the next incarnation of the Flexispeed that was badged as both "Flexispeed", "Meteor" and "Meteor 11" - and produced after the company had moved to Southampton, occupying premises in the 'Town Quay Works'. This model had the option of comprehensive guarding of belts and gears and a heavier, though no wider bed with a hollowed-out section below the headstock designed to accept a dog clutch on the leadscrew. An optional and, in relative terms, very expensive screwcutting attachment was available; with its 10 changewheels this accessory added 48% to the basic (1965) price of £31 : 9 : 6d. Even when the changewheels were set up with a compound reduction for a fine feed to the carriage the relative coarseness of their pitch (for the size of lathe) meant that slowest rate obtainable was too fast; to get round this the worm-and-wheel drive to the leadscrew was left in place - a most unusual arrangement. Backgear was also offered and, when fitted together with the screwcutting attachment, made the machine into a very effective lathe able to successfully turn a wide variety of work. At this point the backgears were all contained within the span of the headstock bearings and not, like earlier and later versions, straddling that to the left. Although sold with the Flexispeed name cast into the bed the only advertisements seen for this later version show the "Meteor 11" model, but it is known that when the lathe was supplied with a single swivelling tool slide (as distinct from a compound slide) and without the automatic carriage traverse it was known as the "Meteor 1". The pitch of the leadscrew was coarsened from 12 to 8 t.p.i. with the fine feed rate of the carriage, using the original worm-and-wheel arrangement, set at 0.0015" per revolution of the spindle. Whilst the turning capacity of the lathe was unchanged the finish was improved by the use of chrome-plated handwheels and levers - and then promptly ruined by castings painted in a ghastly light-blue Hammerite. By the end of the 1970s "The Norfolk Lathe & Tool Company Ltd" of Royston House, North Walsham had taken over the lathe and offered it both as a finished unit and a kit of parts for home assembly. Manufacture and marketing eventually passed into the hands of Alphabeta Engineering of Gamers Way Industrial Estate, North Walsham, Norfolk when it became known as the Simat 101; in an attempt to make the lathe self-contained it was offered in a "deluxe" version with a motor and simple countershaft unit made from propriety "Picador" parts. While Flexispeed prospered by keeping their lathes up-to-date with the ever-increasing demands of model engineers, Adept appear to have become stuck in a time warp and, until the end in the early 1960s, offered the same machines as introduced in 1931 and 1933. Rear view of the top slide and toolpost. The thin end plate on the slide was not strong enough. A round bar acted as the alignment guide when setting the tailstock over for taper turning. 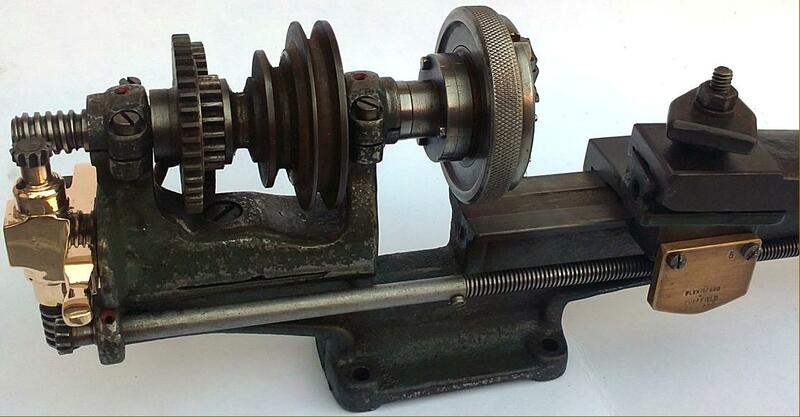 Though a cheap lathe the tailstock barrel was driven by a proper square thread. Flexispeed Mk. 1A circa 1948/49. This version is a mixture of early and late models: a neatly engineered worm-drive fine feed to the carriage, the headstock made as a separate casting but retaining the original centre height, "short-foot" bed and a single swivelling toolslide. Backgear: 40 teeth large gear, 20 teeth small gear. Backgear dia (large gear): 2" 2/16 inch (approx). Backgear width (large gear): 3/16" inch. Backgear dia (small gear): 1" 2/16 inch (approx). Backgear Width (small gear): 1/4" inch (approx). Lathe Base (Foot) Length: 3" 1/2 inch. Lathe base (foot) width: 2" inch. Lathe bed length: 7" 3/4 inch. Lathe bed width: 1" 1/4 inch. Lathe bed gap width: 7/16" inch (approx). Total lathe length: 15" inch. Distance between centres: 41/4" (approx). Distance from lathe bed to centres: 13/8" (approx). Single swivelling tool slide length: 4" inch. Slide width: 1" 5/16 inch. Slide tool capacity: 1/4" square. Headstock spindle length: 5" inch. Headstock spindle diameter: 1/2" inch. Headstock length at base: 3" 1/4 inch (approx). Headstock width at base: 1" 1/4 inch. Headstock length at top (bearing inc): 3 9/16" (approx). Headstock width at rear (auto-feed - backgear mounting points inc) 37/16". Headstock gap between bearings 23/16" (approx).